The body was designed to alert you when something is wrong. Your body has a mode of self-preservation, meaning it wants to be taken care of and live as long as possible. Symptoms of all sorts of issues present themselves as a way to alert you that you need to seek medical intervention. Your mouth works in this same way. If you have a toothache, it is important that you pay attention to it. A toothache is caused by a variety of reasons, some of which are more minor than others; but all of which can be devastating if they are not treated properly and in a timely manner. One of the most common causes of a toothache is relatively simple. Having a piece of food stuck under the gum line is a common occurrence, yet it is one that many people feel silly about. Popcorn kernels are notorious for becoming stuck in the gums, under the teeth. While you may feel silly coming to the dentist for a toothache only to learn that your favorite snack was caught in your teeth, your dentist would much rather treat this simple issue than its more serious concern of rot. Anything that rots inside the mouth will pass on rot to nearby objects – these being neighboring teeth. So, even a simple cause of a toothache needs to be addressed. A cracked tooth is another cause of toothache. When a tooth is cracked, any time you apply pressure to the tooth during chewing or biting, the crack is opened and the inner nerves are exposed. Minor cracks can be treated with filling material, and more serious cracks can be treated so that your tooth is restored. Any type of infection or decay is a cause of extreme pain. When an infection or decay reaches the inner layer (i.e. roots) of a tooth, pain will be excruciating until it the decay is removed and the infection is treated. 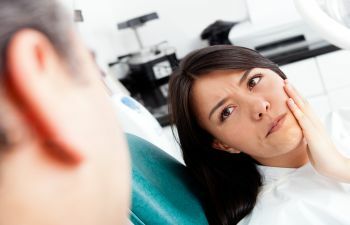 A toothache is not just a “simple thing.” A toothache is something that you need to pay attention to because it is trying to alert you of a serious concern. At Bear Brook Dental Care, we are here to provide you and your family the highest standard in dentistry services. Whether you think your issue is small or large, you need to pay attention to any sort of toothache. Call our practice today to schedule your necessary appointment.